I was wondering if you could help me. I want to start selling my jewelry at craft shows but I have no idea what displays to use and how many to order. Do you have any advice for me? I don't even know where to start. Thank you! The creative use of jewelry displays in a craft show booth can be the ticket to making great sales. Be sure to have plenty on hand to display each of your pieces properly so none are swept to the side. Fire Mountain Gems and Beads carries a wide assortment of display stands for all types of jewelry styles. To make the best use of booth space to display an assortment of rings, use a 24-ring display tray. They make the rings easily accessible to your customers and are easy to pack up and store after the show is over. If you have fewer rings, browse through the other ring display options to find the perfect solution for your needs. For earring displays, consider how many earrings you're selling vs. the available amount of table top space. 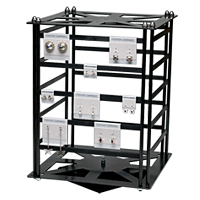 A revolving earring display rack can hold up to 48 earring cards and only takes up 10 square inches of space. For bracelet displays, first determine how you'd like to showcase your bracelets. If you'd like them to be shown open, lay them in a bracelet display tray. This tray can stand upright on your table, and then be broken down and easily packed up with the bracelets inside. 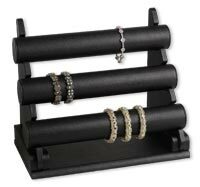 If you'd rather show your bracelets closed, use a tiered bracelet display rack. This will take up a little more room on your table, but you can display up to three feet of jewelry length on one display rack. For displaying necklaces, use a 3-tiered necklace display stand. This version allows you to display 3 or more necklaces. Another good option is a 6-necklace display stand. It has notches at each side onto which you hook the necklaces. Both options are simple to set up and can easily be packed away after the show.